Super simple, not much as far as style, but a fun concept done cleanly and clearly. 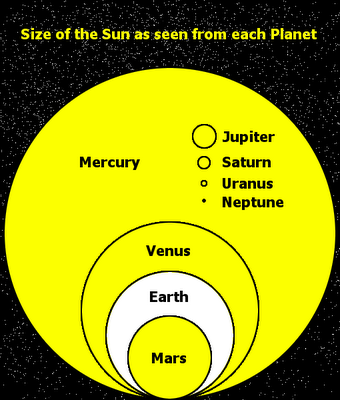 This infographic shows relative sizes of the sun in the sky depending on which planet you would be looking at it from. I know there isn’t a ton going on here, but I’m amazed at how powerful it is, mostly because it’s just not something I ever thought of. There’s something moving about thinking of this many-times-larger Mercurial sun, or the cold distance from Saturn. It’s pretty damn ugly. I’d like to see someone artsify this one. This entry was posted on April 5, 2012, 2:40 pm and is filed under Science, Technology, & Internet. You can follow any responses to this entry through RSS 2.0. You can leave a response, or trackback from your own site.